In these tales from the late 1980s, Batman's war on crime continues. Batman battles Scarface and the Ventriloquist over Fever, a new drug ravaging Gotham City's streets. The Dark Knight must then contend with a dangerous new villain known as the Corrosive Man, a man whom he can't even touch. 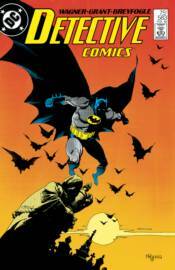 Collects DETECTIVE COMICS #583-591 and DETECTIVE COMICS ANNUAL #1.